The Kingsville Volunteer Fire Company is a 100% volunteer organization that proudly serves the residents of the Kingsville community, the citizens of Northern Baltimore County and the surrounding areas. KVFC proudly provides professional fire and rescue services to the surrounding communities of White Marsh, Perry Hall, Long Green, Jacksonville, as well as responding to the Harford County areas such as Joppa, Joppatowne, Edgewood, and Fallston. KVFC operates two Engines, a Heavy Rescue Squad, Brush unit, ATV unit, Special unit, and a large capacity Tanker. In addition KVFC is proud to be one of three Swift water Rescue Teams serving Baltimore County and Central Maryland. All of the services KVFC provides are made available by our 100% professionally trained volunteers. Our members dedicate their time to company trainings, and classes provided by the Maryland Fire Rescue Academy in order to provide the citizens we serve with the best knowledge and service possible. Our suppression/rescue responses number nearly 1,000 per year. We are one of the 35 volunteer fire companies that work in concert with 24 career stations providing fire/rescue services to Baltimore County. Our Northeastern Baltimore County location means we are called for fire/rescue and EMS services along the always-growing interstate 95 corridor. KVFC Fire, Rescue, and EMS are under the command of our Chief and Assistant Chief. The suppression division is comprised of a Captain & two Lieutenants. Our rescue division is comprised of a Captain & two Lieutenants. In addition to KVFC Providing emergency services, KVFC is very proud of our community involvement and support. 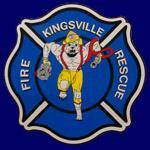 Kingsville is always looking for new members. If you have the desire to serve your community we encourage you to visit our membership portion of our website or stop by the station.